click for your free quote! Whether you’re moving across the street, across town, or to another nearby city, Let’s Get Moving makes your local move an efficient, hassle-free experience. Call us for a no-obligation quote! Let's Get Moving provides local moving services throughout Tampa, St. Petersburg, Clearwater, Bradenton, Sarasota, and more. From delivering a single piece of furniture to your home to moving an entire office or warehouse, Let's Get Moving offers a variety of residential and commercial local moving services to fit your needs. From packing, loading, and delivery, to unloading and arranging your belongings, our team of professional movers is prompt, efficient, and most of all – friendly! Allow us to accommodate you on your next move. From start to finish, you'll be amazed at how seamless it can be! Call us at (888) 204-9666 or in St. Petersburg 727-LGM-MOVE (727-546-6683) to request a free quote! 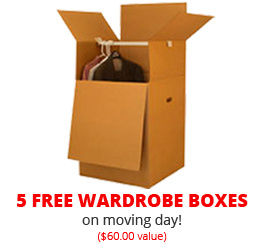 Ask us about our FREE wardrobe box usage on the day of your move (valued at $60). We also provide full placement of furniture and boxes. Everything we disassemble we will reassemble at your new location. © 2012-2019 Let's Get Moving Inc. All rights reserved. Website Redesign By Digital Eel, Inc.